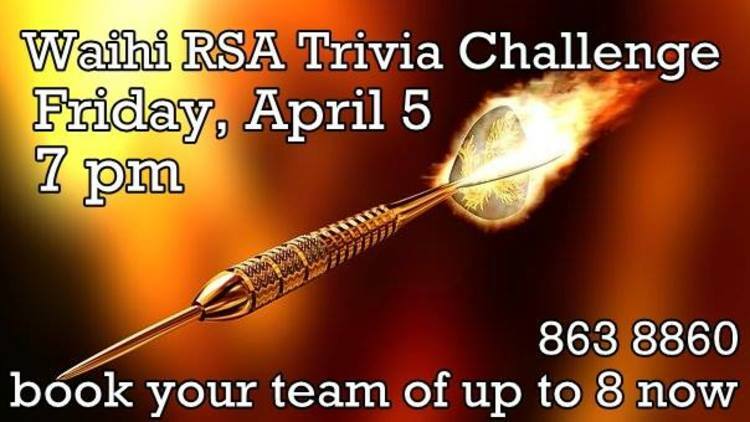 Let's get QUIZZICAL and do the Waihi RSA Trivia Challenge on Friday, April the 5th to support Waihi's very own New Zealand dart champion Wendy Harper to beat the best in the World in London in October. Book your team in... and support Waihi darts champion Wendy Harper to bring home a world title. Enjoy a few drinks, great food and atmosphere and the chance to show off your general knowledge with trivia fun from 7 pm. Phone 07 863 8860 to book your team in. Maximum of 8 per team.